Make sure your BBQ complies with the strict laws governing alfresco areas. Choosing a Barbecue is the most important decision you will make in your alfresco area. 1. Is it legal for the area? 2. Is it built to last? Do you want to waste money replacing it every 3 years? 3. Does it look attractive? 4. Does it have the layout you want? 5. Will it fit into your cabinets? Infresco Barbecue has featured on Chanel 9’s THE BLOCK 2016 with Chris and Kim apartment 4. The alfresco area WON the best outdoor living room with the gourmet Infresco BBQ and Exhaust hood. Infresco gourmet BBQ’s are the only gas barbecue that is APPROVED for an enclosed/ indoor area AUSTRALIA WIDE and you can purchase one online or instore and Outdoor Alfresco Kitchens can freight to mostly anywhere in AUSTRALIA. If you or your plumber have any questions please do not hesitate to contact our friendly staff on 08 6454 8806. Outdoor Alfresco Kitchens’s Gourmet hand made range of BBQ’s are restaurant quality created and loved in the Australian backyard. Experience the joy of an Australian Barbeque manufactured in WA that is heavy duty & rid yourself of a BBQ that makes your party feel basic. The Outdoor Alfresco Kitchens hotplate holds the key with a 12mm thickness & solid welded in plate that creates the versatility of using the entire barbecue hotplate surface from the corners to edges. The heat will be at a constant temperature allowing you to cook all your meat and veggies at the same time. Giving you the most mouth watering masterpieces created by you in your own backyard. Your Outdoor Alfresco Kitchens Gourmet BBQ can cook chicken, beef, lamb, pork & fish. And the Mega Wok burner can cook the perfect stir fries, vegetables, vegetarian meals and breakfasts. Add a roasting hood to cook pizza’s, paellas, cakes, muffins and pudding cook just like in the oven. In fact, imagine cooking just outside your back door, keeping the kitchen clean, tidy and free of heat and lingering smells. Created by a commercial appliance designer with over 35 years experience has designed and manufactured commercial equipment that to this day we are still seeing been used in restaurant kitchens around WA. Outdoor Alfresco Kitchens ’s Logo says it all Designed for Life. Combination options of hotplate, grill or wok. 18 mega joule cast iron wok burner- the most powerful domestic wok available. Outdoor Alfresco Kitchens Gourmet Barbecues com with flat lids as standard. However, you have the option of purchasing a roasting hood instead of flat lids. Our Outdoor Alfresco Kitchens Gourmet Barbecues come in 4 standard sizes: 900mm, 985mm, 1185mm, and 1360mm. You can insert any combination of open grill, hotplate and wok into these standard size barbecues. However, we find that many of our clients like something even more impressive and functional. For those who want to entertain the horde (yes, your wonderful extended family, your footy team mates etc) we can custom make a barbecue for even the most discerning entertainer! We often have requests to build in deep fryers, branding plates, warming trays, extra large woks, stove burners etc. Outdoor Alfresco Kitchens also offer a top-mounted barbecue. This is when we place the BBQ control knobs on the top of the BBQ. The Barbecue is lowered into the benchtop and the knobs are not visible from the front of the barbecue. Unfortunalety TOP MOUNTED BARBECUES are only approved in WESTERN AUSTRALIA for indoor areas. 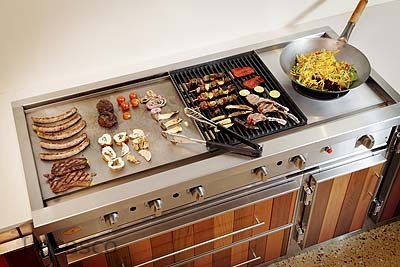 Out top-mount barbecues are available in a full hotplate, hotplate and wok or a hotplate and grill combo. Optional roasting hood also available.